globe in left, treading down one of two captives. Q in right field, XXI in ex. Aurelian (Latin: Lucius Domitius Aurelianus Augustus; 9 September 214 or 215 – September or October 275) was Roman Emperor from 270 to 275. Born in humble circumstances, he rose through the military ranks to become emperor. During his reign, he defeated the Alamanni after a devastating war. He also defeated the Goths, Vandals, Juthungi, Sarmatians, and Carpi. Aurelian restored the Empire's eastern provinces after his conquest of the Palmyrene Empire in 273. The following year he conquered the Gallic Empire in the west, reuniting the Empire in its entirety. He was also responsible for the construction of the Aurelian Walls in Rome, and the abandonment of the province of Dacia. His successes were instrumental in ending the Roman Empire's Crisis of the Third Century, earning him the title Restitutor Orbis or 'Restorer of the World'. Although Domitian was the first emperor who had demanded to be officially hailed as dominus et deus (master and god), these titles never occurred in written form on official documents until the reign of Aurelian. Aurelian was born on 9 September, most likely in 214 AD, although 215 AD is also possible. The ancient sources are not agreed on his place of birth, although he was generally accepted as being a native of Illyricum. Sirmium in Pannonia Inferior (now Sremska Mitrovica, Serbia) is the preferred location, which was created by Aurelian as Emperor when he abandoned the old trans-Danubian territory of Dacia. The academic consensus is that he was of humble birth and that his father was a peasant-farmer who took his Roman nomen from his landlord, a senator of the clan Aurelius. Saunders suggests that his family might in fact have been of Roman settler origin and of much higher social status; however, his suggestion has not been taken up by his more recent academic colleagues such as Southern and Watson. It is commonly accepted that Aurelian probably joined the army in 235 AD at around age twenty. It is also generally assumed that, as a member of the lowest rank of society - albeit a citizen - he would have enlisted in the ranks of the legions. Idiosyncratically, Saunders suggests that his career is more easily understood if it is assumed that his family was of Roman settler origins with a tradition of military service and that he enlisted as an equestrian. This would have opened up for him the tres militia - the three steps of the equestrian military career - one of the routes to higher equestrian office in the Imperial Service. This could be a more expeditious route to senior military and procuratorial offices than that pursued by ex-rankers, although not necessarily less laborious. However, Saunders's conjecture as to Aurelian's early career is not supported by any evidence other than his nomen which could indicate Italian settler ancestry - although even this is contested - and his rise to the highest ranks which is more easily understood if he did not have to start from the bottom. His suggestion has not been taken up by other academic authorities. His successes as a cavalry commander ultimately made him a member of emperor Gallienus' entourage. In 268, Aurelian and his cavalry participated in general Claudius' victory over the Goths at the Battle of Naissus. Later that year Gallienus traveled to Italy and fought Aureolus, his former general and now usurper for the throne. Driving Aureolus back into Mediolanum, Gallienus promptly besieged his adversary in the city. However, while the siege was ongoing the Emperor was assassinated. One source says Aurelian, who was present at the siege, participated and supported general Claudius for the purple – which is plausible. During the reign of Claudius, Aurelian was promoted rapidly: he was given command of the elite Dalmatian cavalry, and was soon promoted to overall Magister equitum, effectively the head of the army after the Emperor – the Emperor's position before his acclamation. The war against Aureolus and the concentration of forces in Italy allowed the Alamanni to break through the Rhaetian limes along the upper Danube. Marching through Raetia and the Alps unhindered, they entered northern Italy and began pillaging the area. In early 269, emperor Claudius and Aurelian marched north to meet the Alamanni, defeating them decisively at the Battle of Lake Benacus. With his base of power secure, he now turned his attention to Rome's greatest problems — recovering the vast territories lost over the previous two decades, and reforming the res publica. The end result was that the Empire could not endure the blow of the capture of Emperor Valerian in 260. The eastern provinces found their protectors in the rulers of the city of Palmyra, in Syria, whose autonomy grew until the formation of the Palmyrene Empire, which was more successful against the Persian threat. The western provinces, those facing the limes of the Rhine, seceded to form a third, autonomous state within the territories of the Roman Empire, which is now known as the Gallic Empire. In Rome, the Emperor was occupied with the internal menaces to his power and with the defense of Italia and the Balkans. This was the situation faced by Gallienus and Claudius, and the problems Aurelian had to deal with at the beginning of his rule. The burden of the northern barbarians was not yet over, however. In 271, the Alamanni moved towards Italia, entering the Po plain and sacking the villages; they passed the Po River, occupied Placentia and moved towards Fano. Aurelian, who was in Pannonia to control the Vandals' withdrawal, quickly entered Italia, but his army was defeated in an ambush near Placentia (January 271). When the news of the defeat arrived in Rome, it caused great fear for the arrival of the barbarians. But Aurelian attacked the Alamanni camping near the Metaurus River, defeating them in the Battle of Fano, and forcing them to re-cross the Po river; Aurelian finally routed them at Pavia. For this, he received the title Germanicus Maximus. However, the menace of the Germanic people remained high as perceived by the Romans, so Aurelian resolved to build the walls that became known as the Aurelian Walls around Rome. His monetary reformation included the introduction of antoniniani containing 5% silver. They bore the mark XXI (or its Greek numerals form KA), which meant that twenty of such coins would contain the same silver quantity of an old silver denarius. Considering that this was an improvement over the previous situation gives an idea of the severity of the economic situation Aurelian faced. The Emperor struggled to introduce the new "good" coin by recalling all the old "bad" coins prior to their introduction. Aurelian's short reign reunited a fragmented Empire while saving Rome from barbarian invasions that had reached Italy itself. His death prevented a full restoration of political stability and a lasting dynasty that could end the cycle of assassination of emperors and civil war that marked this period. Even so, he brought the Empire through a very critical period in its history, and without Aurelian it never would have survived the invasions and fragmentation of the decade in which he reigned. 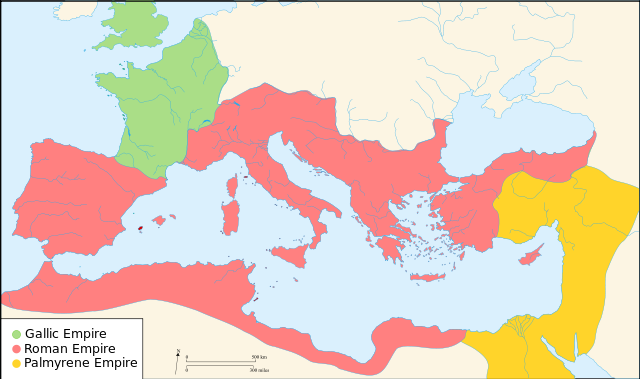 Much hard fighting remained for his successors before the Empire finally regained the initiative against the Persians and the northern barbarian peoples, and it would be another twenty years or more before Diocletian fully restored stability and ended the Crisis of the third century. However, after that the Western half of the Empire would survive another two hundred years, while the East would last another millennium, and for that Aurelian must be allowed much of the credit. The city of Orléans in France is named after Aurelian. Originally named Cenabum, Aurelian rebuilt and named it Aurelianum or Aureliana Civitas ("city of Aurelian", cité d'Aurélien), which evolved into Orléans. The city of New Orleans (in French, La Nouvelle-Orléans), in Louisiana, United States is named after the commune of Orléans, and therefore by extension, Aurelian.